Our dog has noise related fears…they calm him down and keep him even. My fussy dog loves the flavor and does the trick to make him more comfortable. Great for calming my dogs seperation anxiety. My dog Ruby is loving these chews! She gets so excited when I grab the bag. I personally like them because not only are they good for Ruby but they also smell good! Thank you! I have 2 dogs — one is SUPER picky — I am so glad that she likes these! My 12 yr old black lab loves all the flavors. It helps keep her tummy calm with her meds for joint stiffness. My little furry one just loves them and I can see a difference in her overall attitude and energy. She’s almost 15 yrs old and was starting to have her senior moments. The dogs love these! Can’t tell yet how effective they are. My little dog loves these . The quality is great. I feel good feeding them to her. These are wonderful for our almost 16 year old Queensland Heeler. And even better, she absolutely loves them! Other brands she would refuse to eat. My dog loves them. He sleeps better and has enhanced mobility. Very efficient and easy to get. Works just great. They will eat them , but I have to add something like chicken before. Really love these for my Rat Terrier/Chihuaha Mix. Calms his anxiety well. My 13 year old border collie mix loves the taste of these hard chews. However, after 2 weeks, we have NOT a seen significant improvement in her mobility, but our vet indicated that it may take 3 to 4 weeks to see positive results. It may be helpful for others to knows the results may not be immediate. I give my 70# Pitbull Caesar 2 chews a day. One turkey flavor and one sweet potato. He enjoys both flavors and I am hopeful that they will alleviate his anxiety over fireworks on New Years Eve. my dog loves these too!! Has really helped my 12 year old Springer Spaniel when she gets anxious. My dog loves these and I can tell they help him relax and stay calm! These worked like magic. About 15 minutes after the first dose Baloo was feeling better and moving more freely. Now we add drops to the chews and that is even better. We tried another brand first and it was not nearly as effective so we are sticking with treatibles. My 13 year old Beagle/Aussie Shepherd was struggling with joint stiffness. After a few short weeks of taking this product, my dog has made great strides in his movement. He seems to be more spry and even lost some weight. Love you guys! My dog had a hip injury a couple of years ago, and when I found treatibles, it helped more than any other product! I tried a local hemp chew company, and my dog wouldn’t eat it at all! I’ll stick with you guys! My granddaughter’s dog, Max loves Your products. thank you for these chews!! My doggies love them and it’s helping one with their joint stiffness. My dogs love these! So far, turkey is their favorite flavor, but they also like the blueberry and pumpkin. They haven’t tried the sweet potato yet. Your product is excellent. My only issue was with shipping which I contacted your customer service about. The USPS took exceptionally long to deliver this item. Maybe consider an alternative vendor (FedEX, UPS) in the future? Just tried them tonight for Thanksgiving. We had a bunch of people over and I thought it may help with anxiety. I think it did help some. She didn’t get so worked up like she usually does. I’m looking forward to trying it again. My two Akitas love the chews. I have only given them the chews twice, so it is too soon for me to tell if it will help with their anxiety and aggression toward other dogs. First bag of this flavor but all 4 seem to like these as well. Rocky suffers from anxiety. He was born at the Humane Society and we couldn’t bring him home until he was 5 months old, and we believe the many unseen sounds attributed to his jumpy-ness! I give him 1 1/2 chews before we go out, go to the vet, groomer, etc… It really helps him be less anxious and jumpy. This is the 3rd pack I’ve bought and he’s loved the flavor of all chews. 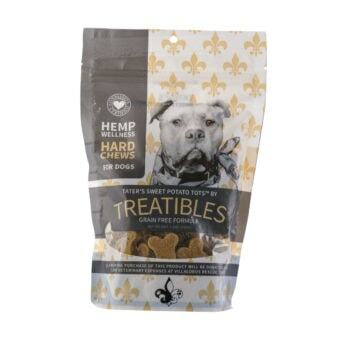 Treatibles is the only full spectrum hemp oil brand of dog chews I’ll buy, mainly because I know what’s in it. My dog loves these and calms him without being “loopy”. Great customer service too! Overall, I’m happy with the product. It works very well for one of my dogs. I think the dosing might be a tad off. My little 7lb maltese eats a full chew and it works well for her. We have lots of construction going on around the house and the nailguns make her nervous. Theses chews made a big difference. My other 10lb maltese ate just one and it didn’t do a thing for him. He’s right on the border of eating one or a little more (according to the weight on the package). I have found that he needs one and a half or maybe two. I haven’t given him two yet but one and a half doesn’t do much for him either. It could be that he is just a high strung little guy. I also wish there was some instruction stating how often to give these treats. I’ve only given them 1x per day so far, but I’ve wondered if they could have more than one dose, if necessary. I would recommend these treats as an alternative to any prescription as a great place to start. Also, my little one doesn’t have any teeth, but doesn’t have any issues eating these. I break them into small pieces and she eats them just fine. They are not “hard” like you would think. They crumble easily. We had the pleasure of speaking with Michele, and were able to offer some assistance with dosage. We offer a starting dosage suggestion as a place to begin for pet parents, but being that every pets’ endocannabinoid system is extremely unique, we do encourage pet parents to experiment with an increased or decreased dosage as needed to best fit the individual pet. Our starting dosage suggestion for the small chews is one chew for every 10 pounds of body weight, so we would suggest one chew to start for both the 7 and 10 pound Maltese. It sounds like while the one chew may be appropriate for the smaller Maltese, the high strung little man has a higher dosage recommendation. The appropriate range for a dog can range anywhere from .1 mg per lb which is our starting dosage suggestion, all the way up to 1 mg per pound, which for this little guy would be 10 whole chews. Treatibles are safe and non-toxic, you cannot overdose, so we encouraged Michele to offer the 2 full chews to the “high strung” man, with continual increases if needed until the desired effect is achieved. This dosage can be given every 4-8 hours as needed, as repetitively and long-term as deemed necessary. My dog has separation anxiety. Treatibles have greatly helped her. Her vets have noticed the difference. She loves the turkey chews. We also use the drops. I also put some drops on my cat’s dry food. My cat eats the food with the drops on first, then eats the rest. Too soon to really tell. But Treatables seem to be helping our senior dog sleep at night. My pitty should be called a “picky” , but he loved the chews….my little dog…well…she loves food😁 I will buy them again! Mystic loves her turkey grain free Treatibles! We call them her “special chews”. She looks forward to getting them every morning. There are many products out there. This is the only one I have been using for over 1 year on my 16 year old and 8 year old “pups”. It works. Treatibles has allowed me to take my dog off some of her meds. It has helped her with her anxiety, and the discomfort she experiences due to joint stiffness. These chews have changed my 14 year old Westie’s life for the better. He no longer has the crunchy joints and is in a better mood. Thank you so much Treatibles for this amazing product. Has helped my golden/chow with anxiety issues. The service was immediate very happy. My dogs love their hemp Treatibles! My doggies LOVE these chews!!!! I definitely see some difference with my dog after giving him these chews. Seems calmer and laid back. I think next time I would give the oil a try to see if those have a better affect. Unfortunately these did not work for our terrier/Chihuahua mix, but honestly I think our dog is beyond help lol. Product seems great however and shipping was quick. Worth a shot! Really helped my 10 year old Chihuahua Guillermo with energy and mobility. Great product. So happy to have found it as it helps my dog’s Tstorm anxiety. These are the BEST things we have EVER found for our fur babies!! Thank you soooooo much! What an improvement in my dogs mobility with her joint discomfort! I have a 13 year old GSP with discomfort in his lower spine and it affects his hind legs. One treatable in the morning and one at night and he does quite well and is comfortable. He does get acupuncture on very rough days. Delivery was fast. We were discussing discomfort management with our vet after our girl was diagnosed with inflammation of the vertebra, now she takes her two chews a day and is discomfort free. Plus, the chews smell amazing!! LIFESAVER! I have a dog rescue with 10 dogs in my home, while I go through a major home renovation with stranger walking all around and on top of my house with hammers and skillsaws. I knew my dogs would lose their minds. We have gotten up early every day and had our Treatibles in advance of the construction, and my dogs have been amazingly calm during the experience. More than I ever imagined. Treatibles is responsible for me getting a new house…..thank you!!! Perfect to calm my small, overly hyper dog down when I need it. Our dog loves these chews, and they help immensely with her leg discomfort due to stiff joints and our conservative management of issues in her back knees. Thank you so much for providing an alternative to pharmaceutical pain meds! Product definitely helped our dog feel more at ease, without really affecting her personality. She loves them as a morning chew. Just wish they were a little less expensive! Our dogs love these chews! They get them every day! Excellent product! I have a highly reactive Beagle. These little chews take the edge off for her so she can enjoy being a Beagle! I am pretty amazed how well they work and have told many other pet owners about them. First, off – wow!!!!! This is a game changer for us! OK, now a bit of backstory. We adopted her 2 years ago from the SPCA. While she loved all humans, we quickly found out she was highly dog reactive…and I mean highly!!!! We found her the right trainer, and spent a lot of time and money to help her, and we were thrilled with the change. But she still struggled with many scenarios, one of which was walking past another dog when they were coming from the opposite direction. Even when we were on the opposite side of a wide street, she would still react pretty strongly. So, we tried Treatibles. We give her 1/2 a 4MG treat before our morning run….and you know what, she is better!!!! We still make sure we are on the opposite side of the street when we pass a dog, but most of the time, she simply gets a bit whinny and a bit too excited, but no barking, no lunging!!!!! WOW!!!! So thrilled. The journey with our sweet pup continues. I bought these for my mom’s dog so I haven’t seen them in action myself, but mom’s first report is that they helped calm her dog in a thunderstorm. This is a dog who melts down and shakes in storms. Very effective in addressing the anxiety of my dog. AMAZING! Our dog has always suffered from extreme separation anxiety. Finally there is something that allows him to relax without making him “doppy”. What a relief! Highly recommend these !!! Love all the treatible flavor… or I should say my dogs do!!! Our dog is very frightened by thunder storm. Initially she did not like taste but faked with cheese. It had a moderate calming effect. Thanks. My 15 year old yellow lab has been dealing with extreme difficulty standing and walking to the point of needing assistance often. A prescription med. he was on was causing him stomach issues and nausea I believe. I stopped the meds. when I began the Treatibles. While not a miracle cure, he is doing better with mobility and seems less depressed and less nauseated. He loves the taste of the Treatibles too! That’s a plus, since he can be difficult. I’m glad I tried them for his problems. This product is excellent for my 12 year old hound. He’s happier, more comfortable and has more mobility. My dog did not like these and wouldn’t eat them, but he’s quite particular about what he will eat. I even crumbled them on his food and he ate very little. The Turkey chews help two of my dogs with their health symptoms, my Chihuahua has anxiety and the chew helps her calm down & relax. The another dog is Shih Tzu, and she has kidney issues and discomfort in her hips, and the chews really do help her to be more calm & not bitching, and playful with her other brothers and sister. The another thing with my Shih Tzu, she is picky with chews, but she like the Turkey flavor and the pumpkin flavor Treatibles. My almost 11 year old 80 lb. pit mix has some joint issues, and in the last year or two developed a slight fear of fireworks and thunderstorms. These chews work wonderfully for both. I give him one, sometimes one and a half and he chills. He prefers chewy texture over hard so I’ve bought the drops as well. If your dog is picky I suggest breaking the chew into pieces and serving in dry or wet food. I’ll definitely buy again. Thank you. Taking a daily Treatibles has eased my 16-year-old dog’s joint discomfort. Didn’t expect miracles but definitely has more zip to her steps. And she LOVES these chews! Win-win. This product is extremely helpful for my 11 year old German Shepherd who is suffering from a terminal illness. My Boston Terrier recently has exhibited “meltdowns.” While trying different things to minimize her discomfort her trainer have me Treatibles to try. So when she begins to hide I prepare her one-half of a Treatible which just takes the edge off whatever sound has caused her such distress. Helped our older dog (17) tremendously with joint discomfort and general comfort level. Best thing ever to calm my crazy chihuahua mix who hates fireworks. Love how well the treatables work for my dogs hip, as long as I keep him on them he runs around like a puppy! Been using Treatibles for less than two months but it seems to be helpful. Our dog loves them and they have helped her with her joint discomfort. Not only do these chews help curb my pup’s anxiety issues, she really loves the taste of them! My 14 year old wolf hybrid has joint discomfort and problems walking with his hind quarters. Without Treatibles he really struggles, but when he takes them he is more comfortable and has so much more range of motion. Amazing product! Thank you so much!! They work great for calming our old pitbull and helping with his joint discomfort. Lifesavers! This is the only thing I have found to help my dog’s thunderstorm anxiety. In addition our other dog has had serious leg surgery and has anxiety at confinement. Again, lifesaver. So glad a friend recommended I try this product. Great job guys! Great product has helped my pit out with his bad knees. This has worked wonders and changed my chocolate Labrador. She is finally not limping and is playful and does not to appear to be in discomfort. Highly recommend! like they are young again. So thanks for the help with the discomfort in there necks! Tried the new turkey chews recently, my dog seems to like them as much or more as the blueberry chews. I give her 2 in the morning and sometimes 2 more later in the day. It has helped with her back discomfort and agitation. She is going up and down the stairs with ease. Delivery was prompt. My dog seems to be more playful and less moaning from his joint discomfort. My 18 year old was dealing with joint discomfort and always has had anxiety issues; requiring a VERY set schedule. Although it has gotten better with her aging these treats have made a hugely improved disposition!! Isabelle lives for her almost daily 1.5 – 2 mile walks and they were getting difficult which brought on some depression in her. Treatable have made all the difference!! She is showing SO much improvement that she is almost puppy-like!! SO VERY HAPPY AND GRATEFUL FOR A PRODUCT LIKE THIS!! I have a 12 yr old lab mix that has discomfort for a few different reasons, and treatibles help her feel like herself again without getting her to doped up or making her too sleepy. She’s able to move with more freedom and perks up within a half hr of her dose, Thank you Treatibles for giving me such a great tool to help my girl! While my picky older cat won’t eat the Turkey Treatible, even crushed, my mother-in-laws small dog LOVES the treatibles, and it’s help him a great deal with his leg discomfort.My MIL ordered some of the drops that we’re adding to the cat’s food, and his appetite has greatly increased, which is what we were looking for. He’s twenty, has an enlarged heart, and needs to maintian body weight. He’s resting better, too. Thumbs up all the way around for this family. Ghost has back problems. He loves these chews and they seem to be helping him quite a bit. We tried another brand but he didn’t like them as much. He eats these right away. 🙂 Thank you! We recently purchased a bag of the Treatibles on the recommendation of our Vet. he said the treats would work to calm his anxiety and they have done exactly that! I just love the way they allow my dog to be calm when people walk by outside, when someone comes to the door, or when friends come over. He is still a bit “barky” but it’s no longer over the top. He’s very happy to see people, walking him is much easier, and he’s not exhibiting anxious behaviors anymore. We cut the amount down to 1 treatible and that works for him even though he’s a big dog. I simply LOVE these treats! Thank you for helping my dog! Really helps my old dog Luke feel better and improves his appetite. Seems to help with mobility as well. Very happy to have found these. I adopted a dog 3 months ago who turned a year old on September 14, 2017. During his first year of life, Toby had been severely abused and had been rehomed 5 times. He had also spent about a month and a half in the local shelter. Due to being abused, Toby has some mild neurological issues from being hit in the head so hard. He is also terrifiied of absolutely everything. My heart just absolutely broke for him. A few months before I adopted him, I watched a video of Mariah from Villalobos Rescue Center talk about how amazing Treatibles have been for their dogs at the rescue. I thought “wow that’s a great idea”, but at the time had no use for them. Then I met Toby. I immediately purchased Treatibles turkey flavored chews and they have changed his life. He is still very fearful but with these chews, we are able to help him cope and overcome his fears. Treatibles is an amazing company! Both their products and costumer service are the best I’ve ever seen. I recommend them to anyone whose dog has any sort of anxiety or behavioral issue. We are a life time customer now. I – and my tibetan mastiff – love the new (revamped) large dog treats. She gets 3 daily as her snack and is more interactive and seems more content. Previously, she only got them for stressful circumstances but now the higher mg /treat enables daily dosing, We are both happy! My dogs absolutely love them. One of my dogs has a pretty high stress level and they really seem to calm her down. Thank you. I have 2 large aging dogs that struggle to get up stairs and to their comfy spots. The use of treatibles seems to help them move so much better, it’s been amazing. We started using treatibles because our old (14 years) Aussie couldn’t stand up to go outside. Day one of treating her with treatibles she got up and went outside. It was amazing. Thank you for this product. my 12yr. young dog enjoys these treats and they have certainly contributed to his having more energy- he is up and around more and even does some “puppy runs”. We started with one treat and are now up to 3 treats. Thanks Paula and Brewster. She loves the way they taste, and she does get around a little bit better! She definitely goes to the pantry and sits there, every four hours or so, until we give her more. Lol. It’s adorable. My 13-year-old black German Shepherd stopped chasing rabbits about a year ago, and she became increasingly lethargic at home. The vet recommended acupuncture and CBD supplements. Unfortunately, Lissa wasn’t fond of the biscuit brand I tried first (allegedly bacon/maple flavor), so I had to marinate the biscuits in peanut oil to make them palatable to her. Even so, she still had to be coaxed to eat them. In desperation, I decided to try Treatibles™ Large Turkey 4mg Grain Free Chews. When they arrived, I held my breath and offered one to her. She took one quick sniff and immediately signaled, “I’d like to have that, please.” Hooray! She continues to take the treats without hesitation when offered. Still not able to chase rabbits, but she enjoys playing with the younger dogs at the off-leash park. …and that makes her dad very, very happy! Through most of the issues with our fabulous behaviorist Christine Nolan . Some issues remain however. There are times he just seems moody. Treatables helps so much with that. He seems happier and more relaxed. We ran out for a couple days and definitely noticed the difference without his treats. His favorite flavor is turkey. My dog is picky when it comes to meds, and even CBD. So I was thrilled that she just adores these! And they help so much after her surgery! Great product. Rescue gal recommended. My seniors seem to be doing better. The chews were for My Granddaughter’s dog, Max Who has anxiety issues. I buy them often for Max and not only do they help him a lot, but Max loves them ! We have a 1.5 yr old hound mix. He is a good dog except he tends to be very jumpy. Barks aggresiviely at people walking by the house, territorial with our other dogs, and basically goes nuts if someone is at the door. We have been giving him one and a half of the large Treatables every morning for a few weeks now and have noticed a difference in his behavior. He seems to be less edgy. He is not so jumpy and seems to be a bit less aggressive. More relaxed around the house and on walks etc. I definitely noticed a positive difference. I also want to add that the folks at Treatables were very helpful and very responsive as I had a couple of questions before I purchased. A customer service! Got these for my Husky. She’s got anxiety issues. We give these to her at night to calm her out and she sleeps so good! Our dogs suffer from sore joints symptoms and these have helped. We have tried a few different brands, none work as good as Treatibles. Others left him agitated when they wore off. Toby had a tuff start before we got him. He is a great dog, but still has issues. When he gets spun up, sometimes he can’t reset on his own. Treatibles are working great at helping him find his reset button. Treatibles work great and Toby approved. My 11 year old, 42 pound dog has been slowing down a bit lately. Just hesitant to jump up, napping a lot more and seems stiff at times, coming from a VERY active dog I was concerned. His vet recommended these and I’m so happy she did! At first I thought he seemed tired after does #1, but about an hour later he was playing and running around happy as can be. A treat first thing in the morning has shown us a huge difference in his attitude and agility. He will be on a 3-a-day treat schedule as long as I continue to see these results. Thanks y’all. Shiloh is an 8 year yellow lab that we adopted, shortly after we adopted her we noticed she was was constantly licking or chewing her paw. We thought she was just anxious because we adopted her from her family. My dad suggested I try treatables, and after figuring out her happy zone, her paw began to heal. It was amazing! But my mistake was thinking her anxiety was just temporary, I started to wean her off of treatbles…. biggest mistake I made. She immediately began to lick and chew her paw again. After feeling horrible, and having her vet read her 8 year vet records, her vet said she has seems to always have anxiety, and if these cookies keep her calm them don’t stop and she WON’T need to be on pills. Music to my ears and she has never been off since. The pictures I uploaded is her paw in each healing stage, to the point you can’t even tell. The only thing we try now are the wonderful new flavors treatables comes out with. Treatibles are really helping our rescue lab-mix with anxiety and aggression toward other dogs! We’re so glad there’s a natural solution out there like this. And the best part is that the company sent us a replacement order (for free!) after our initial order got lost in the mail/stolen. Thank you so much!!!! I can’t thank treatibles enough! My boy has had anxiety since he was a tiny puppy and it’s only getting worse as he grows up. Now at two years old he was losing his young spirit, developing fears and ocd behaviors. I decided to try these as a suggestion from his trainer and I am SO HAPPY to say I have my puppy back! Within the first two weeks Dylan is happy, silly, and vibrant again. We will never be without these treats. I didn’t even realize how much of him was missing but I truly have my boy back again. Thank you, thank you! My senior dog is on the Tater Tot flavor that benefits Villalobos. Unfortunately he has gotten to the point where he needs just a little more. So now he gets one of those in the morning and, when he’s having a bad day, he gets one of the turkey ones at night. As a bonus, I have also been able to start giving them to my little dog that has collapsing trachea. It helps her to calm down a little and breathe easier. Additionally, these treats proved to be amazing at keeping both of them calm during Hurricane Harvey. My 11 year old all white JRT had come down with terrible shakes. (Fairly common with older small white dogs) It was so sad to look at him always shaking even when he was sleeping. After a week on the treatibles and no more shakes! Unfortunately I ran out earlier this week and now they are back ;( I just placed an order for 4 bags and I will make sure to always have them on hand for my little guy. Thank you for bringing this product to the market! I have a one year old shih tzu that we drove from Texas to Wisconsin for the holidays. We knew it would be a long trip for her so we purchased these to try to calm her anxiety in the car. She’s normally fine in the car but this was a 20 hour trip with very few stops! We wanted her to be comfortable and relaxed. These worked great! She was calm and slept most of the trip. We also give these to her for general separation anxiety when we have to leave her at home for longer than usual. She loves both the turkey and blueberry flavors. We have to dip them in peanut butter because she doesn’t like hard/crunchy treats. These are a great resource for any dog, any age! Thank you for a great product. My 14 year old Chihuahua is slowing down. His beloved walks were becoming more and more difficult for him. And his appetite was decreasing. Now that he gets Treatibles, he can walk most of our 1.25 mile trail. I do have to carry him for a short while. And he has more of an appetite. Have to 15 year old pugs with various ailments due to aging. So far the Teatables seem to be making small improvements to both dogs. Have not noticed a drastic change as some reviews have stated. However they absolutely love them and for that alone I will continue to use. My 13 year old Boxer loves these treats!! She’s been given them approximately 3x per day. She seems to be happy and more playful in general. I believe they also make her a bit hungrier, so I’m careful with her food/treat intake! We have tried several products to address our dog’s anxiety to thunderstorms. This is the only thing that seems to work for her. Definitely reduces her stress and helps her relax. We are very thankful and pleased with the product. I recommend you give it a try. My terrier mix dog has always been high strung. As he has aged-he is almost 14-his anxiety and OCD behaviors just got untenable. He loves the Treatible biscuits, and we have seen considerable improvement in his behavior. When I had questions, the customer service people emailed me right back with answers. Never want to run out. Nothing but happy with the Small Turkey 1mg Grain Free Chews I purchased. They smell great and my Pug loves em!!!! My husband and I are over the road truckers and Snoopy started out a great truck dog bit through the years she has gotten anxiety (we think, she just shakes and pants). I didn’t want her on pills, I wanted/needed a holistic method. I could go on and on about your product, thank you. She gets 2 a day and she’s totally Snoopy, plus Coco gets 3 for her separation anxiety bc we are people after all, we do enjoy sitting down to a hot meal together every other day. We’ll be placing another order next week and are looking into the bulk. We got the blueberry and the turkey, they enjoy both, but really seem to like the blueberry more. Again, thank you for coming out with a safe and wonderful product. …Of course, I wouldn’t know exactly what they taste like now, would I? However, Juba loves these Treatibles and is perfectly happy with them, so I think you’ve done very well with these new turkey treats…and just in time for Thanksgiving…! Well done, folks! Thank you!